Vera Wang introduces youthful charm and romance through hand-painted tulles and silks. This week's featured wedding dress, Didi, showcases innovative design techniques from Vera Wang. Vera offers her insights on the design inspiration behind Didi. can be described as nothing less than vivacious. Didi illustrates an important technique in the use of color: hand-painting. The full skirt is a combination of hand-painted organza and tulle that tumble from the structured, pleated bodice into artful deconstruction. You will see this frothiness throughout the collection, along with a very specific delicate lightness that is created through the layering of fabrics rather than crinolines (stiff petticoats under the skirt). The pleats on the Didi's bodice are particularly dramatic at the back of the wedding dress. 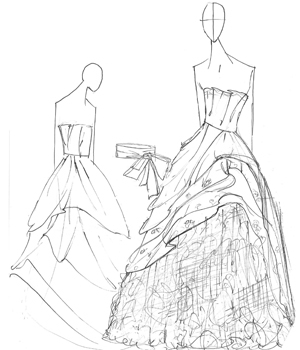 Didi captures artistry, which is another common thread in Vera Wang's recent collections, along with whimsy and charm. These themes are soft, but not antiquated. The crispness of the design technique and the use of color establish the modernity of these wedding dresses. Keep in mind, Vera Wang wedding dresses shown in color are also available in traditional white and ivory; contact one of our wedding consultants for more detail. The design of the bodice is the centerpiece around which other components of a wedding dress are created. Like a foundation garment, a bodice is defined by its construction and its fit. The bodice of your wedding dress should be tailored to the length of your torso. Precise fit is crucial for a strapless wedding dress, such as Didi, as the bodice requires stays for support. delicate ruffles, billowing sleeves or layers of tulle, as shown here on Didi. Passionate and adventurous, the Romanticist seeks to be transported by her wedding dress. What kind of bride are you? Learn more about Vera Wang here on Apparel Search or visit the official Vera Wang Site.